At Everlast Services we love decking design. We love how versatile decks are, how hardy they are and how incredible they can make a space look. A deck can turn a patch of dirt into a living space, it can turn an empty bit of your backyard into the scene for countless barbecues, family get togethers, Christmas lunches and endless discussions. There’s something about a good timber deck that appeals to everyone. The natural boughs, bends and hues of the wood and the way the natural material feels under your feet all come together to create a sense of aesthetic beauty and absolute functionality. The best part is, all you have to do is give it a varnish every couple of years and it will retain its beauty for years to come. Wood is one of the most workable natural materials on the planet. You can bend, chop, sand and shape it almost any way you want. That’s what makes it such a perfect material for making a deck. If you’ve got an odd shaped backyard or space you’ll still be able to find a solution to fit you. 20 years in the industry has given us an understanding of how to use a deck to get the most out of your space. We will listen to what you want and use our experience to give you a selection of deck designs and ideas to choose from and because the options are endless you’ll be spoiled for choice. Why Everlast for Your Decking Design? Experience counts for a lot when it comes to designing a deck. Understanding the slopes and bends of your space is crucial in ensuring that you have a decking that works for you and lasts. 20 years is a long time, we know what we’re doing when it comes to decking and you’ll benefit from this knowledge when it comers to designing your dream decking. We are 100% Australian owned and operated and we try and use Australian materials and products as much as we possibly we can. 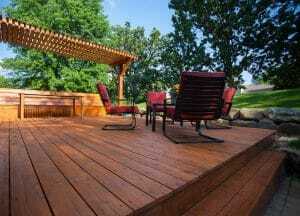 If you’ve always wanted a deck but have been put off by the price contact us today. We love providing our customers with quality installations at affordable prices.